Fletcher, Banister; Cruickshank, Dan, Sir Banister Fletcher's a History of Architecture, Architectural Press, 20th edition, 1996 (first published 1896). আইএসবিএন ০-৭৫০৬-২২৬৭-৯. Cf. Part One, Chapter 4. William W. Hallo & William Kelly Simpson, The Ancient Near East: A History, Holt Rinehart and Winston Publishers, 2nd edition, 1997. আইএসবিএন ০-১৫-৫০৩৮১৯-২. 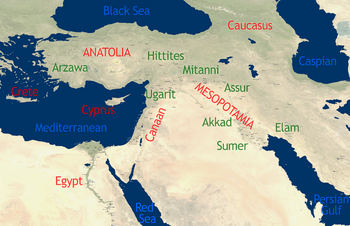 Marc Van de Mieroop, History of the Ancient Near East: Ca. 3000-323 B.C., Blackwell Publishers, 2nd edition, 2006 (first published 2003). আইএসবিএন ১-৪০৫১-৪৯১১-৬. Vicino Oriente[স্থায়ীভাবে অকার্যকর সংযোগ] — Vicino Oriente is the journal of the Section Near East of the Department of Historical, Archaeological and Anthropological Sciences of Antiquity of Rome ‘La Sapienza’ University. The Journal, which is published yearly, deals with Near Eastern History, Archaeology, Epigraphy, extending its view also on the whole Mediterranean with the study of Phoenician and Punic documents. It is accompanied by ‘Quaderni di Vicino Oriente’, a monograph series.